If we do a backwards extrapolation of the measured expansion, we find that about 14 Gya all spatial objects were in the same place. This figure has recently been refined to 13.8 Gya. [ref]According to the WMAP project, the age of the universe is 13.77 ± 0.059 billion years. http://map.gsfc.nasa.gov/universe/uni_age.html. The ESA Planck probe finds 13.799 ± 0,021 billion years. We will settle for 13.8 Gya. [/ref] The entire visible universe once occupied a very small region, smaller than the size of an atom. It is important to understand that we can see only part of the cosmos, the visible universe, or what we call “our Universe”. It is limited in size because of the time light takes to get from a distant point to us and because of the age of the universe. Light travels with a finite speed, so the more distant an object or event, the more time light takes to reach us and the farther back in the past the event we are seeing. The most distant objects we can see are therefore the oldest, those which emitted their light at the time of the Big Bang, about 14 Gya. Because space has been expanding in the meantime, such objects are now about 46 Giga light-years away, which is thus the current radius of the visible universe. [ref]Carroll (2010), 387n38. [/ref] It is, of course, getting bigger all the time. In a nutshell, our universe started out smaller than the current size of an atom. It was roughly uniform but with tiny quantum-mechanical fluctuations (often referred to as “jitters”). Almost instantly, on a human time scale, it inflated (expanded) enormously to about the size of a grapefruit. [ref]Tegmark (2014), 117. [/ref] The rapid expansion isolated the quantum jitters before they could resolve. When inflation stopped, a mainly uniform space had been filled with matter formed from the spread-out quantum fluctuations. Since that time, it has expanded well beyond what we can see of it. Here’s more detail. The inflaton field was in a state of unstable equilibrium. Anyone who has ever been delicately balanced, say on a taut rope, so that if she leans one way or the other she starts to fall, understands what it means to be in unstable equilibrium. At about 10-35 seconds of age[ref]Greene (2004), 285. [/ref], the field “lost its balance” and started to “fall” (metaphorically) off its high value. After about 10-32 seconds, space had “fallen” as far as it could in the inflaton field, effectively hitting “bottom”. More precisely, it reached its point of minimum energy in the inflaton field. 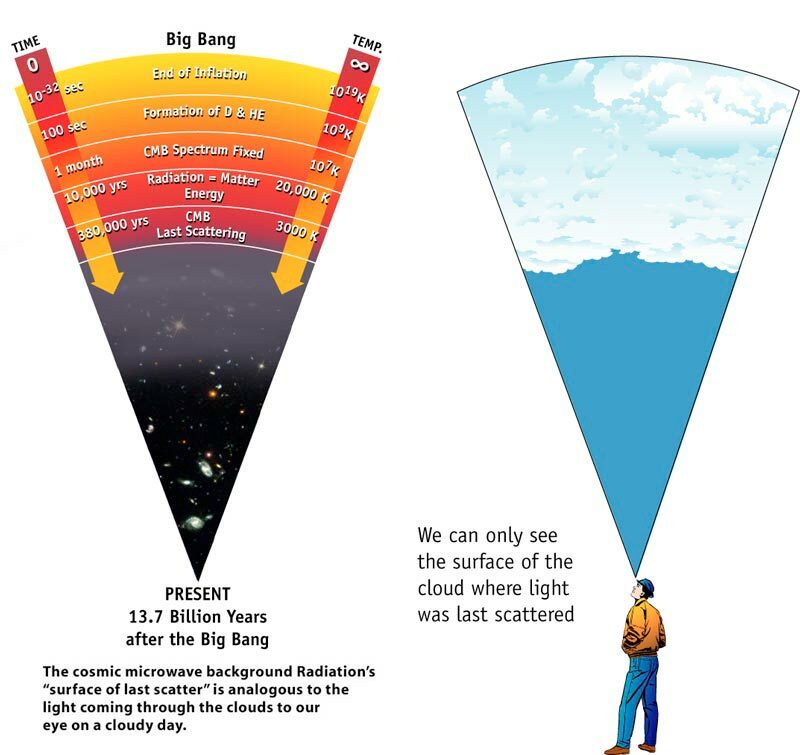 The inflation stopped but the universe went on expanding, but more slowly, under the outwardly-directed pressure of gravity (the cosmological constant). The energy released by the “falling” inflaton field provided the energy and matter that constitute the universe today. As each bit of matter exerted a gravitational attraction on every other bit, the rate of expansion slowed down. 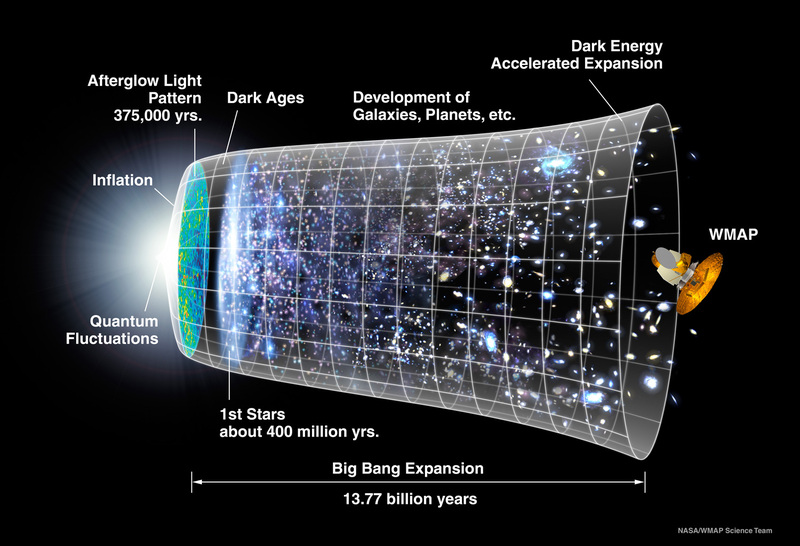 When the universe attained the age of about 7 billion years, the expansion rate began accelerating. More on that later. Once the inflaton field’s energy was spent, inflationary expansion ended. The universe went on growing under the pressure of the cosmological constant, but the gravitational attraction of all that mass limited the expansion. As the universe expanded, it cooled. [ref]Think of how a bicycle tire gets hot as you pump air into it; this is just the opposite phenomenon. All temperatures from Guth (1997), 86-94. [/ref] It was then that the first step in the formation of chemical elements began. At around one second of age[ref]Guth (1997), 94. [/ref], the universe’s temperature was “cool” enough that the frenetic activity of all those particles calmed some. Protons stopped changing into neutrons, but neutrons still decayed into protons and electrons. [ref]Since neutrons are slightly heavier than protons. [/ref] Neutons which did not decay combined to make an isotope of hydrogen called deuterium (2H, one proton + one neutron). Electrons and positrons annihilated to form huge amounts of photons, visible today as the Cosmic Microwave Background radiation. By 30 seconds of age, about half the electrons and positrons had mutually annihilated. After about 380,000 years, the temperature of the universe descended to around 3000 Kelvin, and the electromagnetic force bound electrons with nuclei to form atoms, a process called recombination by cosmologists. The binding of electrons in atoms was equivalent to a phase change (like, say, water freezing to ice) and is considered as such by physicists. Photons now were no longer deflected by electrons and the universe became transparent, although the number of photons was so low that it was still dark and there were not yet any stars to make more light. The photon radiation was emitted in all directions and is still “visible” today. [ref]Since it is in the microwave frequency, we cannot really see it. [/ref] This Cosmic Microwave Background Radiation (CMB) is light from 13.3 Gya.